For the Pasta Party dinner I hosted recently, I wanted to include some favorite appetizers on the menu. One such appetizer is stuffed mushrooms. 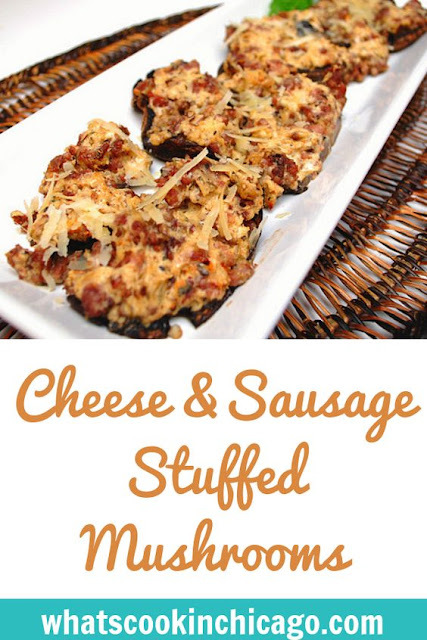 Using portobello mushrooms in place of the standard white button mushrooms was wonderful because the meaty flavor worked well with the cheese and italian sausage filling I created. Even filling the mushrooms was a breeze since the caps were large and shallow enough to hold a good amount of filling. The original recipe called for only a cheese filling however I added italian sausage for additional flavor. These could easily be served up as a meal in of itself with a nice side salad too. I would also suggest playing around with the filling - maybe use blue cheese and add some caramelized onions, along with a drizzle of balsamic vinegar. Hmmm... sounds like I might play with this recipe even more soon! Preheat oven to 350 degrees F (175 degrees C). Spray a baking sheet with cooking spray. Clean mushrooms with a damp paper towel. Carefully remove mushroom gills and stems. Heat oil in a large skillet over medium heat. Add garlic and crumble in italian sausage. Saute until sausage is browned and set aside to cool. When garlic and sausage mixture has cooled, stir in cream cheese, Parmesan cheese, black pepper, onion powder and cayenne pepper. Mixture should be very thick. 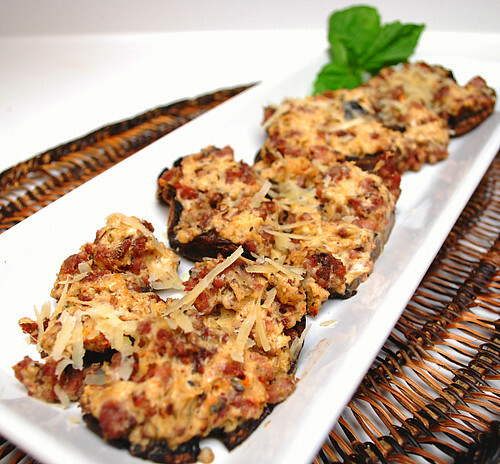 Using a little spoon, fill each mushroom cap with a generous amount of stuffing. Arrange the mushroom caps on prepared cookie sheet. Bake for 20 minutes in the preheated oven, or until the mushrooms are piping hot and liquid starts to form under caps. Plate up mushrooms and cut into wedges. Serve hot. * To make ahead/freezer meal: After stuffing mushroom cap, place in an oven & freezer-proof baking dish or gallon sized freezer bag and freeze. When ready to prepare, bake in preheated oven from frozen for 20-30 minutes until hot and liquid starts to form under caps. I have never try using cream cheese. I have to try it next time. I generally use ricotta and panko. Great pic! Can i use regular mushroom caps instead of Portobello? so you don't need to blanch our name the mushrooms before freezing?